The local TAFs were indicating an unflyable day for Sunday with low cloud and rain all afternoon. On the basis of the quality of previous forecasts, club members turned out to fly anyway. Initial conditions weren’t far off forecast with mist at the airfield although you could see blue if you looked straight up. 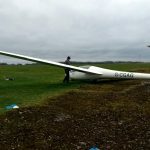 As our duty instructor Andy set off around the field to find somewhere usable to take-off and land, we readied the ground equipment and sailplanes for use. Field set-up was one of our less common arrangements with the launchpoint at the top of the south-east stub runway and the winch as far around the track as we could get it for a maximum-length run albeit cross-wind. The landing area was along the edge of the cross runway on a “One-Five” 150 degree heading marked on the right by the cross runway itself and on the left by a white sheet marker ~100m from the north fence . This marker indicated a “not before and not left-of” point to avoid the soft ground giving a total solid landing area of ~8x300m. 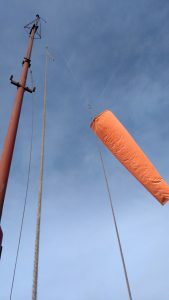 In practice, the objective of rolling to a stop parallel to and just behind the launchpoint so that the aircraft could be pulled online by hand meant actual landing distances of <200m. By morning briefing we had a keen bunch of solo and pre-solo pilots ready to fly. The newer pilots got to experience flying approaches across the north field onto what is a slight down-slope on “one-five” for the first time. Launch heights weren’t the highest due to the short run and the negligible headwind component so actually getting from the top of the launch back to a high-key point south-east of the field for a left-hand circuit would pretty well deliver you to the circuit “on energy”. All of the student pilots achieved a left-hand circuit although some less optimistic solo pilots took the easy option and shot right-hand circuits instead. We opted early in the day for single-cable towout due to the soft areas of the field but the cable retrieve landrover decided to cut-out and have a day off. 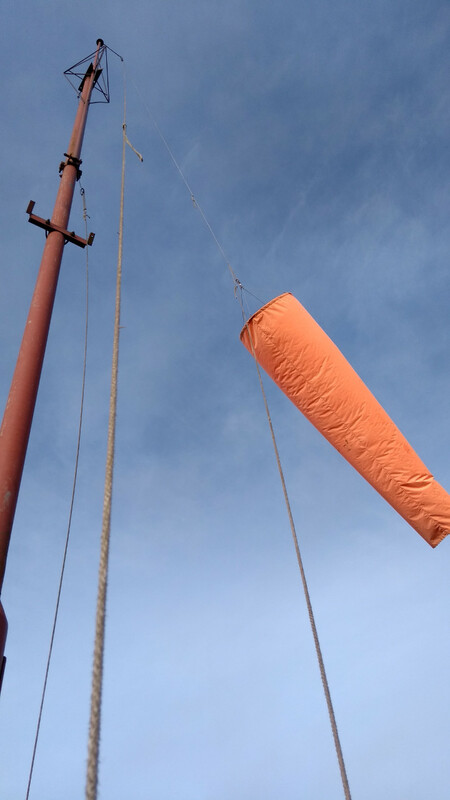 We re-tasked one of our glider retrieve vehicles to tow the cable out instead which worked rather well. A very brisk cycle of launches and landings meant the cable retrieve was in near continuous motion. The weather proceeded to defy the forecasts with increasing visibility and cloudbase and no sign of rain. 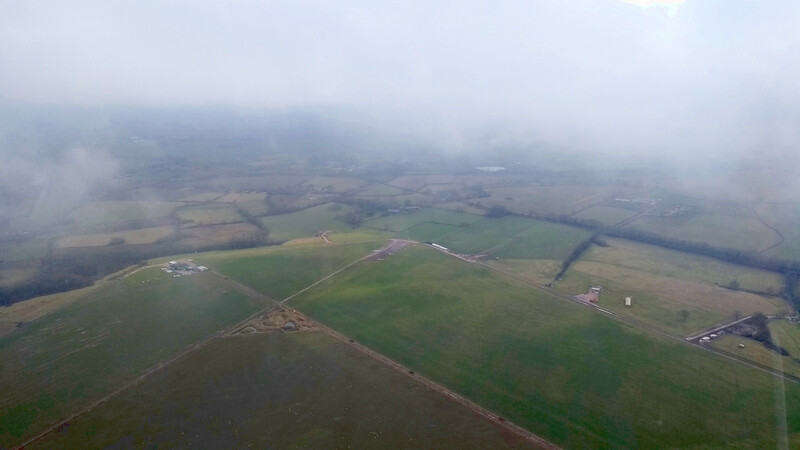 Although it was never going to get as good as the last couple of days, it was no hindrance to training flights. Dave P and Archie managed to get four flights each in, Archie getting back into solo flying as did Bob. The unusual circuit allowed for approach-control demos including side-slip approaches. The quick manual landing-area clearances meant that the ‘alternate’ landing area along the eastern perimeter track was never used. 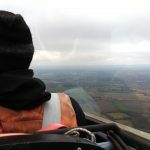 Phil C flew with Andy in GAG, training towards his P1 rating and possibly IFP rating which allows flying with other club members in the two-seat gliders. Bingo and Geoff worked hard for most of the day over at the main hangar applying new paint to the structural metal to prevent long-term corrosion. Around mid-afternoon Peter C finally joined the exclusive group of operators who can call themselves *real* winch drivers, an achievement we celebrated later at the Snitterfield Arms. Despite the low visibility at the start of the day and single-cable ops, we managed to get 38 launches done, the majority of which were training flights for our student pilots. A huge thanks to everyone who stayed late for the big team effort at the end of the day when we ran into trouble putting the kit away. Especially Bingo who provided the method and solution. We’d have been truly stuck without you. 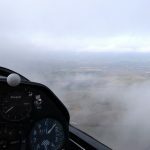 This entry was posted in Flying reports and tagged flying report, flying training by admin. Bookmark the permalink.